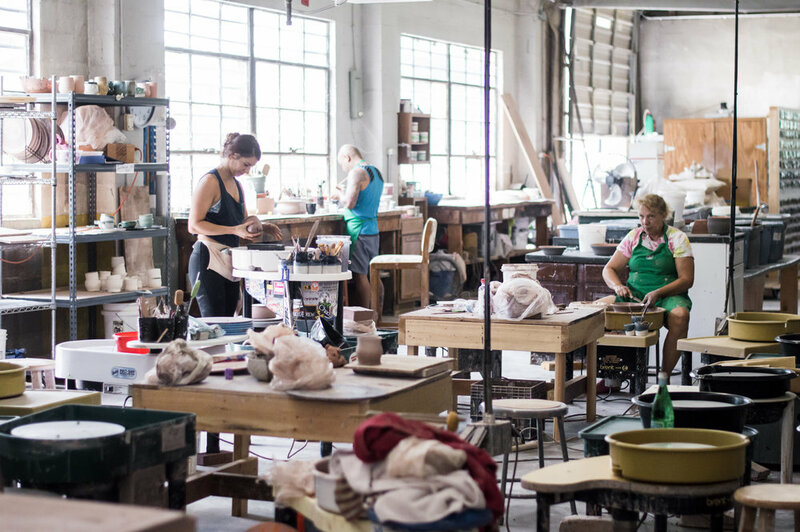 When it comes to ceramics, a class can get you hooked. That’s the message from Mighty Mud, a ceramics studio and workshop on Jennings Avenue in Happy Holler. Owner Barron Hall fell for ceramics while studying at the University of South Florida in Tampa. “I was a painting and drawing major, but I had to take a 3D course for my degree. So I took a ceramics course and I got hooked. Potter Ellie Kotsianas, who is an instructor at Mighty Mud and its social media manager and “party planner extraordinaire,” had a similar experience. So the folks at Mighty Mud share that same experience with Knoxville potters and wannabes through a plethora of classes. Several of the potters at Mighty Mud offer six-week wheel throwing classes on different days of the week and at various times. There are also classes for kids, or “mini mudders,” as they’re called at Mighty Mud. And then there are a variety of one-time Friday evening classes for folks who want to dip a toe in the clay, so to speak. Beginners can try the Raku process or make a cup, bowl and plate on the pottery wheel. They can sip on wine while creating their own ceramic wine cup. They can come for Sunday brunch with some wheel throwing on the side. Around 50 artists rent space at Might Mud, and at any given time there are about 50 students taking classes there. Ellie Kotsianas appreciates the eclectic group and the environment they create. “Mighty Mud is this huge community of people wanting to learn ceramics,” she said. “We have a gallery area where people can purchase handmade local work. We have retail space for artists to purchase glazes and clay and all sorts of stuff. “Come in and get your hands messy and learn something new. Put yourself out there,” she said.